Vaccines are to prevent a disease, they do not cure a disease. This is a 1000 doses of a wing web stab type vaccine, which is recommended for birds 8 weeks or older, and normally gives lifetime immunity. a viral disease which affects the central nervous system of chickens, pheasants, turkeys, and quail. It is found worldwide. Morbidity 5-60%. Mortality can be high. The route of infection can be through the egg; lateral transmission (from bird to bird) is probably by the oral route, incubation >10 days. Virus in droppings may survive 4 weeks or more. Transmitted both through the egg and by direct contact. Eggs laid by hens with sub-clinical infection will carry the virus. While hatchability drops, eggs will hatch and chicks will develop clinical disease soon after. Affected chicks shed virus in feces and will infect other chicks. Can also be introduced through the import of sub-clinically infected adult breeding stock, infected day-old chicks or hatching eggs. Signs can be •Nervous signs. •Dull expression. •Ataxia and sitting on hocks. •Imbalance. •Paralysis. •Muscular tremors are best seen after exercising the bird. •Tremor of head, neck and wings. Tremor may be inapparent but is accentuated if chicks are held upside-down in the hand. Prevention is by vaccination of breeders at 8-15 weeks. Immunity is long lasting. There is no treatment. •Some birds recover, and others may survive with persistent clinical signs. Signs commonly appear at 7-10 days of age, although they may be present at hatching or delayed for several weeks. Typically, about 5% of the flock is affected, although morbidity and mortality may be much higher. The disease in adult birds is inapparent except for a transient drop in egg production. •Sick birds should be isolated and potentially (humanly) destroyed as few of them recover. •Good supportive care may be helpful in some cases. •Sanitize the premises •Immunization of breeder pullets 8-15 wk old with a commercial live vaccine is advised to prevent vertical transmission of the virus to progeny and to provide them with maternal immunity against the disease. 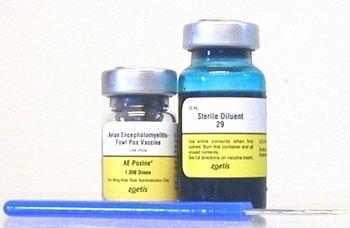 •A combination vaccine for fowl pox and avian encephalomyelitis is widely used. Even though the disease can be eliminated from flocks by immunization, but sometimes it recurs after several years. A relatively slow-spreading viral disease characterized by skin lesions and/or plaques in the throat and affecting chickens, turkeys, pigeons and canaries worldwide. Morbidity is 10-95% and mortality usually low to moderate, 0-50%. Infection occurs through skin abrasions and bites mainly, or by the respiratory route. It is transmitted by birds, objects with the virus on them, and biting insects (insects can be infected for 6 weeks). The virus can live in the environment for months. It is more common in males because of their tendency to fight and cause skin damage, and where there are biting insects. The duration of the disease is about 14-21 days on an individual bird basis. Signs: •Warty, spreading eruptions and scabs on comb and wattles, and sometimes legs. •Caseous deposits in mouth, throat and sometimes trachea. •Depression. •Poor appetite. •Poor growth. •Poor egg production. Treatment - None. But individuals still unaffected may be vaccinated, by wing web puncture. If there is evidence of secondary bacterial infection, a broad-spectrum antibiotic may be helpful. Prevention- By vaccination at 8 weeks or older, preferably before production age. There is good cross-immunity among the different viral strains.